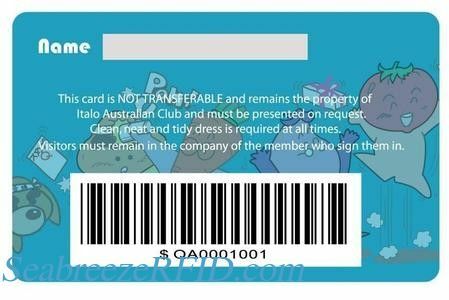 Barcode cards can also make the RFID card encapsulation chip.Can also be on the surface hot laser gold or laser silver, or with a magnetic stripe, etc. 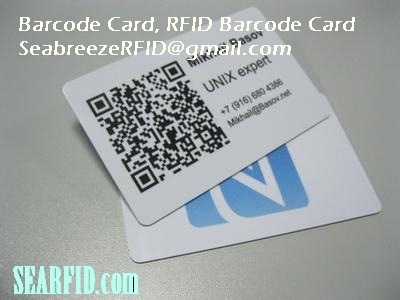 UV barcode card, if the bar code on the surface of UV effects, so the barcode will have stereo feeling, and wear resistance. Chip: MF 1k S50, MF 4k S70, MF Ultralight 10, MF Ultralight C, I CODE SLI/SLI-S/SLI-L/SLIX, MF EV1 2K/4k/8K, Ti2048, EM4200, EM4305, EM4450, TK4100, T5577, CET5500, Hitag1, Hitag2, Hitag S256, MF PLUS2K/4K, FM11RF08, FMl208(CPU), etc. Materials: PVC, ABS, PET, PETG, Paper, etc. 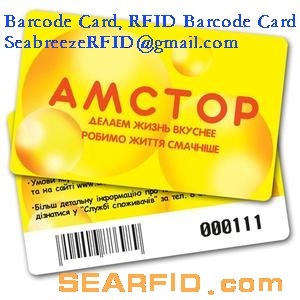 Barcode card is divided into two kinds of One-dimensional code and QR code. One-dimension code is commonly used, such as daily commodity barcode on the outer packing is One-dimensional code. Its information storage capacity is small, can store only a code, when using through this code to taken data in a computer network. QR code is developed in recent years, it can in the limited space to store more information, including text, images, fingerprints, signature, etc., and can used break away the computer. (3) Interleaved 2 of 5 Code: a variable length of continuous self checking system of digital Code. (4) Code 39 (Code 3 of 9): length variable discrete self checking letters word type Code system. (6) Code128: a variable length of continuous alphanumeric code system. (8) Other Code: Code 93, Code 49, Code 2 of 5, 11 code, Matrix 2 of 5 code. Printing: Offset Printing, Silkscreen Printing, Thermal printing, Ink-jet printing, Digital printing. Security features: Watermark, Laser ablation, Hologram/OVD, UV ink, Optical Variable ink, Hidden barcode/Barcode mask, Graded Rainbow, Micro-text. Others: Chip data initialization/Encryption, Personalized magnetic stripe programed, Signature panel, Barcode, Serial number, Embossing, DOD code, NBS convex code, Die-cut. Declare: The showing picture is only for reference of our product. All related to intellectual property rights of trademark are belongs to trademark company.